Now is the perfect time for you to become a Papa Ray's franchise owner! We are a young company growing quickly in the restaurant industry. Because we are small, we are economical and easy to work with. Our size allows you to get the help you need from the executive team of Papa Ray's, who have the experience and passion to make you successful. Our business model will be a guide to making your restaurant prosperous. We consistently create restaurants that succeed in their marketplaces using the support of our experience, distinctive brand, delicious recipes, and effective marketing strategies. Every dish is affordable, delicious, and fresh. Our homemade pizza sauce is full of flavor and our pizzas are cooked to perfection in our traditional deck ovens (we do not use conveyer belt ovens). 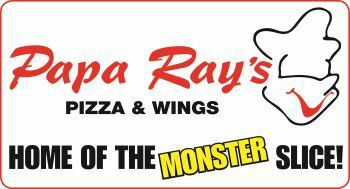 The Papa Ray's MONSTER slice is a customer favorite. The MONSTER slice is made with quality ingredients, is 12 inches long and is topped with savory cheese. Other favorites include rib tips, wings, calzone wraps, mac and cheese, and wings which are fresh, never frozen, breaded and fried to perfection. Our online ordering system and late hours will give your restaurant the reputation of being convenient and reliable. Papa Ray's has dine-in, delivery and carry out options at all of its restaurants.